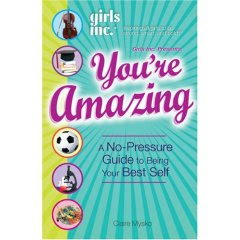 Girls Inc. Presents: You're Amazing! A No-Pressure Guide to Being Your Best Self . What's an amazing girl like? She asks questions because she knows it's okay not to know the "right" answer. She tries new things because she knows the power of learning from mistakes. She knows how to take pride in her accomplishments, no matter how big or small. Inspired by - The Supergirl Dilemma report, in which more than 1,000 girls shared their stories of feeling pressure to be perfect, You're Amazing! is a girl's guide to giving up the quest to be "super" and to start celebrating what makes her amazing. Packed with Girls Inc. activities, quizzes, insight from girls and older teens, and advice from women role models, the book gives girls the tools and tips to feel good about who they are. You're Amazing! addresses the issues challenging girls today—from family to school to crushes to the future—and encourages girls to find the inner voice that makes them unique, special, and above all, amazing. What a beautiful book and beautiful photo. Hi Sabina, I forgot to tell you how darling the picture of Faith is on your Blog and what a wonderful book for young children to read. Wait until you see the picture of the kids I took on that same day -- sooooo beautiful!! Thanks for the very nice mention of You're Amazing! I was excited to see that your daughter read the book this summer. And what a fantastic photo. That just made my day! Love the sound of this book. I think it'll be great for my daughter.